Delegate: Dr. Ludovic Mouffe , Federal Public Service Economy. In the coastal province of West Flanders, Western part of Belgium, marine renewable energy is seen as a new emerging market, highly relevant for Flanders and Belgium. There are several initiatives promoting the development of the blue economy, including marine energies. The ‘Strategic Framework for Smart Specialisation in Flanders’, describing the on-going policy process for proprietary areas in the innovation and strategy of Flanders, points out the sectors of Blue Economy, Blue Growth and Blue Energy in Flanders as prioritised areas. WESTDEAL is then focussing on West Flanders. The West Flanders Development Agency (POM West Flanders), responsible for the implementation of the social economic policy of the Province of West Flanders, is supporting developments in the blue energy field, promoting the development of ocean energy technology by the academic sector and private companies. Factory of the Future “Blue Energy” is the action plan of the province of West-Flanders (POM). Moreover, POM has introduced TUA West, an agency that acts as a liaison between partners from various industries and civil society, supporting the triple helix model of establishing links between companies, knowledge institutions and governments. The Flemish Agency for Innovation and Entrepreneurship (VLAIO) has been supporting a new ‘Innovative Business Network Offshore Energy’ since 2017 and in 2018 set up and a ‘Blue Cluster’ aimed at large companies & SMEs active in the blue economy sector, including marine energies. Belgium has become member of the Europe Leading Blue Energy (ELBE) project aiming to position Europe as the world technological and industrial leader in “blue” energy. A relevant European funded project - MET-CERTIFIED - coordinated by the Dutch Marine Energy Centre is developing recognised standards and certification schemes in the sector. Ghent University and POM are the Belgian partners in MET-CERTIFIED. Ghent University is coordinating the recently approved COST Action CA17105 WECANet an open pan-European Network for Marine Renewable Energy with a focus on wave energy, which supports training, networking and collaboration in Europe. This project is funded by the European COST Association and involves 29 countries. The Flemish wave energy developer Laminaria is developing a 200 kW prototype to be tested at EMEC’s grid-connected wave test site in 2019, through the European funded project LAMWEC. Ghent University is strategic partner in the H2020 MARINERG-i project coordinated by the MaREI Centre at University College of Cork Ireland, which brings together all the European countries with significant testing capabilities in offshore renewable energy. MARINERG-i is developing a plan for an integrated European Research Infrastructure, an independent legal entity, designed to facilitate the future growth and development of the Offshore Renewable Energy sector. 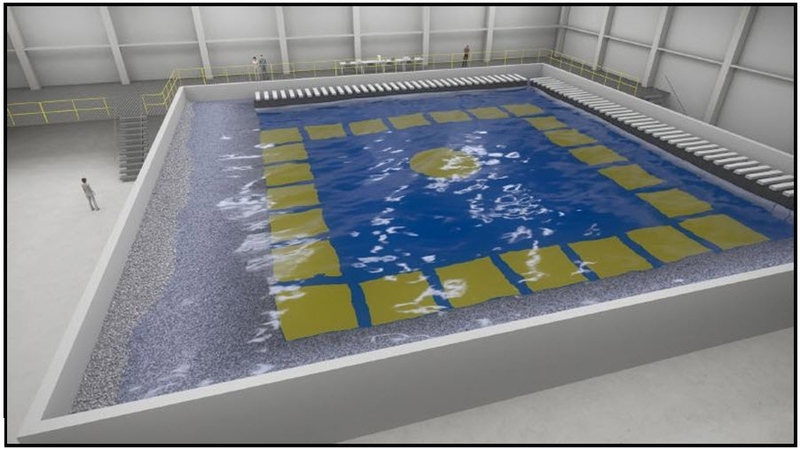 Ghent University is participating in MARINERG-i with marine energy technologies testing infrastructure which includes wave flumes and the new Coastal and Ocean Basin. Belgium has to increase its share of renewable energy production to 13% of the total consumption by 2020, following the general European Union objective. This share has been growing steadily in the last year. Currently, Belgium’s renewable energy share is at around 9%, with a 2020 target of 13%. Main incentives aim at wind energy (onshore and offshore), biomass, biogas and solar energy. The offshore wind energy concessions in the Belgian North Sea will have the biggest impact on renewables, leading up to a total of ±2200 MW of offshore wind power installed by 2020. A green energy certificate market is implemented to support onshore renewable energy production with Tradable Green Certificates (TGC). For each renewable technology, a stakeholder analysis is put forward to determine the level of support. A generic business case is constructed with input of the developer, the technology supplier, investors, banks, etc. This exercise will determine the cost of the renewable electricity and the matching value of the TGC in €/MWh. The business case is frequently updated in order to align the new TGC support with the technology evolution. In the coastal province of West Flanders, Western part of Belgium, marine renewable energy is seen as a new emerging market, highly relevant for Flanders. There are several initiatives promoting the development of the blue economy, including marine energies. The Provincial Development Agency West-Flanders (POM), responsible for the implementation of the social economic policy of the Province of West Flanders, is supporting developments in the blue energy field, promoting the development of ocean energy technology by the academic sector and private companies. Factory of the Future “Blue Energy” is the action plan of the province of West-Flanders (POM). Moreover POM has introduced TUA West, an agency that acts as a liaison between partners from various industries and civil society, supporting the triple helix model of establishing links between companies, knowledge institutions and governments. The Belgian maritime spatial plan foresees an area for the exploitation for offshore wind, wave and tidal energy. This area has been divided into 79 zones for which the Government has given concessions for alternative energy project development. The last concession (±55 km from the coast) was granted in July 2012 to the temporary trading company Mermaid. This Mermaid concession zone aims at the installation of 232 to 266 MW wind and 5 to 61 MW wave energy (rated power). This hybrid park has a water depth of 35-40 m and an average wave climate of 6.5 kW/m. The project is planned to be finished by 2020 for wind part of it. The Flemish Agency for Innovation and Entrepreneurship (VLAIO) has been supporting a new ‘Innovative Business Network Offshore Energy’ (IBN-Offshore Energy) since 2017 and in 2018 set up and a ‘Blue Cluster’ aimed at large companies & SMEs active in the blue economy sector, including marine energies. Further activities within the ‘Blue Energy Cluster’ aim at supporting Belgian companies from the ocean energy sector. The IBN-Offshore Energy (http://www.offshoreenergycluster.be/) is a network of Flemish companies innovating in the field of offshore energy (offshore wind, floating wind, wave & tidal). The activities of the IBN Offshore Energy are oriented towards facilitating innovation in this area. The cluster’s mission consists of facilitating the process for its clients by which a concrete idea becomes a fully-realized project plan for a new product or service within the offshore energy sector (focus = offshore wind, wave & tidal energy). Within this innovative business network (IBN) the focus is laid upon RD&I support, knowledge sharing and networking between the members and external. The IBN-Offshore Energy focusses on a number of themes that are relevant to companies operating in the cluster activity. The cluster keeps track of the market and technology developments within these themes and inform its members about the current RD&I calls. In addition, the IBN-Offshore Energy facilitates matchmaking between members regarding these themes and look for opportunities for tackling mutual challenges and opportunities (cluster actions). The IBN-Offshore Energy also looks for international collaborations that would be useful to the cluster. The Blue Cluster (https://www.blauwecluster.be) has been established in the beginning of 2018 and was recognized by the Flemish government as a spearhead cluster in March 2018. DEME Blue Energy is a specialized company that focuses on the development of energy generated from waves, tidal movements and tidal currents. DEME Blue Energy installed the four turbines of MeyGen’s Phase 1A and is involved in the development of two additional tidal energy parks in Scotland and Northern Ireland. IMDC is partner in the SE@PORTS project. Funded by OCEANERA-NET, the main goal of the SE@PORTS project is to assess existing WEC’s (proven concept TRL 3) on their suitability to be integrated in seaport infrastructures and bring the selected concepts of WEC’s to the next TRL. The Laminaria wave energy buoy has an innovative load management mechanism and storm protection system. Development has been supported by the Flemish agency for innovation as well as through several European projects. After successful tests at Plymouth and Ostend, next phase is at EMEC in Scotland. Belgian ENGIE affiliate Tractebel was involved in the pre-feasibility study, technical audit and foundation design of the Raz Blanchart tidal energy pilot project in France. In October 2018, a first “Task force meeting” was held in Ghent (Belgium), to discuss priorities and roadmaps for all 6 domains of activity of the Blue Cluster. In order to help businesses in West Flanders to grow regionally and internationally via innovation, the Province of West Flanders established cluster platforms in the framework of the Provincial Development Agency West-Flanders (hereafter referred to as POM) to proactively prepare its industries for the future. The Blue Energy cluster, focusing on wind, wave and tidal energy, is situated at the Belgian coast and in the Ostend area in particular. Through a partnership between all relevant actors at the local, provincial and Flemish level SMEs are supported in their future-oriented and sustainable development: from practical services to promotion, research, training and infrastructure: the cluster platforms aim to create an optimal breeding ground for a future-oriented economy. The Energy Transition Fund aims to encourage and support research and development in the field of energy. As part of the Energy Transition Fund, the Directorate-General Energy organizes each year a call for proposals. The current call aims to support innovative and research projects within five energy sectors with that of renewable energy in the Belgian exclusive economic zone of the North Sea being one of them. The Energy Transition Fund aims at research and development in the field of energy. The budget of the Energy Transition Fund for the year 2019 amounts to 30 million euros, which can be awarded as a subsidy to projects that meet all relevant conditions and relate to research and development, investment in research infrastructure, innovation clusters or on innovation by SMEs. Ghent University (http://awww.ugent.be) is strategic partner in the H2020 MARINERG-i project (www.marinerg-i.eu) coordinated by the MaREI Centre at University College of Cork Ireland, which brings together all the European countries with significant testing capabilities in offshore renewable energy. MARINERG-i is developing a plan for an integrated European Research Infrastructure, an independent legal entity, designed to facilitate the future growth and development of the Offshore Renewable Energy sector. Ghent University is participating in MARINERG-i with marine energy technologies testing infrastructure which includes wave flumes and the new Coastal and Ocean Basin (www.cob.ugent.be). Visualisation of the new Coastal and Ocean Basin (COB) in Belgium, a testing infrastructure for Marine Renewable Energy. The Flemish government decided to invest 5M euros in the Gen4Wave project. The Board of Directors of the Hercules Foundation approved the proposal by Ghent University and KU Leuven for research infrastructure coupled to Gen4Wave for an amount of 2.3M euros. Gen4Wave is the start of an investment project, including the construction and start-up of a wave tank, featuring waves, currents and wind loads, as test infrastructure for coastal engineering and offshore renewable energy in Flanders. The new Coastal and Ocean Basin (COB) at the GreenBridge campus in Ostend is planned to be operational in 2019. The facility is part of the Gen4Wave project on renewable energy and coastal engineering in Flanders, Belgium, and is co-funded by the Hercules foundation and the Ministry of Mobility and Public Works. 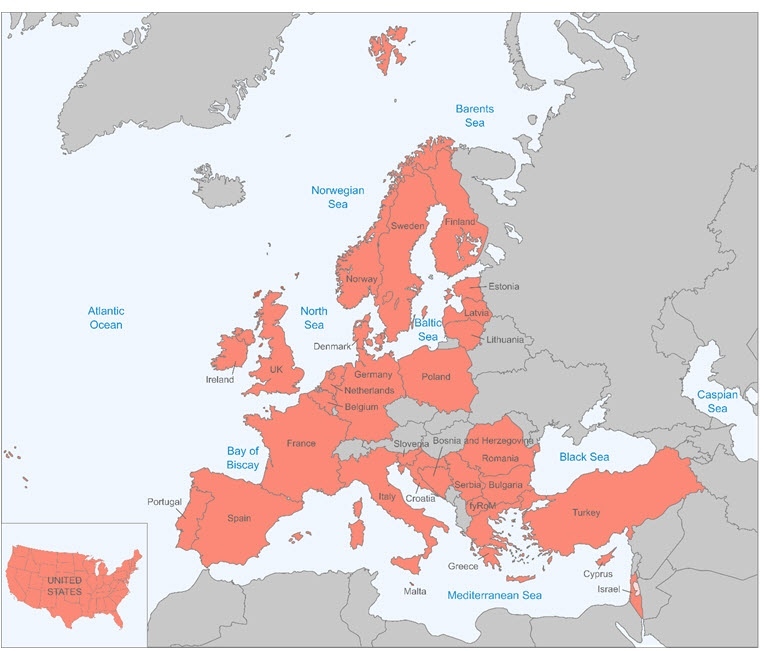 WECANet (www.wecanet.eu) is the new European COST Action network of 30 countries dedicated to Marine Renewable Energy, with a focus on Wave Energy. It is coordinated by the Coastal Engineering Research Group of Ghent University (UGent-CERG). WECANet is funded through the HORIZON2020 Framework Programme by COST (European Cooperation in Science and Technology, www.cost.eu), a funding agency for research and innovation networks. WECANet fosters transnational collaboration, the organisation of training on Marine Renewable Energy topics (international Training Courses), the realisation of the so-called “Short Term Scientific Missions” between researchers of different countries, networking events and dissemination activities. In Belgium, WECANet is coordinated by the Coastal Engineering Research Group of Ghent University (UGent-CERG) and is actively supported by activities of the Flanders Marine Institute (VLIZ, http://www.vliz.be), the Marine@UGent cluster and the Provincial Development Agency West-Flanders (POM). The Research Foundation Flanders (FWO, https://www.fwo.be/) funded in 2018 six PhD research projects (two of them by the previous “IWT”), all of them carried out at the Coastal Engineering Research Group of Ghent University. In 2018 the European ‘EsflOWC’ MaRINET2 project has been completed. EsflOWC (Efficiency & survivability of floating OWC) is a research project of 7 partners coordinated by the Coastal Engineering Research Group of Ghent University. The main purpose of this research project is to test the OWC WEC response and mooring line tensions using different types of mooring materials and different wave conditions. This project (www.met-certified.eu) aims to increase the adoption of insurable and therefore bankable marine energy projects in the 2 SEAS region through the development of internationally recognised standards and certification schemes in the sector. At present no certification scheme for marine energy have been developed and implemented by all main stakeholders in a consistent way. The expectation is that it will come into existence over the next years under the umbrella of the International Electrotechnical Commission (IEC). Therefore, the timing of MET-CERTIFIED is very favorable. MET-CERTIFIED brings together partners from 4 European countries to advance the marine energy sector in the 2SEAS region. MET-CERTIFIED is funded by the European Interreg 2 Seas programme and co-financed by the European Fund for Regional Development (ERFD). Further, the Ministry of Economic Affairs in the Netherlands, Province of South-Holland and North-Holland and the Belgian Province of West Flanders are offering financial support. This project (www.dualports.eu) is coordinated by the harbour of Ostend, Belgium, with funding from Interreg North Sea. DUAL Ports aims to decarbonise Regional Entrepreneurial Ports (REPs)´ resources through a shared eco-innovation port program that minimises their environmental footprint. The objective is to specifically develop sustainable utilities and abilities of (REPs). This will be achieved by collaboratively piloting and managing technologies and processes that tackle targeted measurable direct/indirect emission/pollution sources. The project will ultimately enhance ports organizational/operational (energy) efficiency and performance, facilitating port low carbonization at reduced cost and with knowledge/investment added value. This project (http://www.pecs2seas.eu/) aims to develop, test and implement different tools and technologies in order to reduce the carbon footprint of the Small and Medium sized Entrepreneurial (SME) ports and marinas, and to make their functioning more energy-efficient in a cost-effective way. Next to their own contribution, the PECS partners receive funding from Interreg 2 Seas programme 2014-2020, the European Regional Development Fund, the Provinces North and South Holland. An €11 million Interreg North-West Europe (NWE) project has been launched in Orkney to develop an all-in-one solution for the generation of clean predictable energy, grid management, and the production of hydrogen from excess capacity. Led by the European Marine Energy Centre (EMEC) in Orkney, the €11m Integrating Tidal Energy into the European Grid (ITEG) project brings together partners from across the UK, France, Belgium and the Netherlands to address energy-related carbon emissions in North-West Europe and tackle grid export limitations faced in remote areas such as Orkney. This project (http://www.link2innovate.eu) is an Interreg project run by Greenbridge, an incubator focused on blue growth located in West Flanders. Flemish and Dutch incubators match techno starters with larger companies for a joint innovation project of 1 year. GreenBridge facilitated 4 matches in the area of blue energy: operation and maintenance of blades, structural health monitoring in blue piling technique, wave prediction software development and inspection of port infrastructures by aquadrone. This project (https://h2020-coastal.eu) is coordinated by Greenbridge and has the ambition to connect and reinforce the different policies for a sustainable use of marine space, exploiting new development opportunities related to blue growth. The ELBE project is supported by the EU COSME-programme. ELBE partners want to position Europe as the technological and industrial world leader in blue energy. Five European clusters, including Flanders' Maritime Cluster (soon De Blauwe Cluster), join forces to shape a pan-European blue energy cluster with global ambitions. The focus is on wave energy, tidal energy and floating offshore wind energy. For each of these domains, the ELBE partners select the most important growth markets worldwide through a market analysis. This project aims to create a living lab of near and offshore test facilities with the possibility for knowledge institutions and companies to test blue energy and blue growth innovations in real life sea conditions. Main element of this project is the realisation of an offshore test platform, which will be operational mid-2019 and be open to both companies and knowledge institutions for testing. 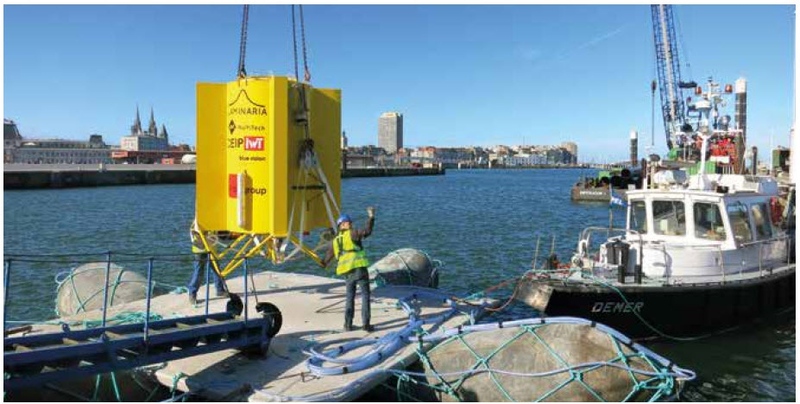 The Flemish wave energy developer Laminaria is developing a 200 kW prototype to be tested at EMEC’s grid-connected wave test site (the European Marine Energy Centre in Orkney, Scotland) in 2019, through the European funded project LAMWEC. NEMOS, a German wave energy developer, is focussing on the installation of a large-scale prototype in the Belgian North Sea. With a floater displacing more than 10 m³ water and a fully equipped powerhouse on an independent structure, the system will generate enough energy to supply several households with electricity. 8 November 2018: Seminar Offshore cables organised by IBN Offshore Energy. 5 October 2018: Seminar Emerging Offshore Technologies - Wave-Tidal and Floating wind power organised by IBN Offshore Energy. 12 September 2018: European COST Action ‘WECANet’ launch meeting in Brussels, organised by the Coastal Engineering Research Group of Ghent University. 23 March 2018: Meeting of Belgian Stakeholders for Marine Renewable Energy within the activities of the HORIZON2020 project MARINERG-i, organised by the Coastal Engineering Research Group of Ghent University.